Cold Comfort Farm is a BBC adaption of Stella Gibbons’ novel of the same name. Set in early 1930’s England, the story focuses on young Flora Poste (Kate Beckinsale) who is left penniless when her parents die and goes to stay with distant relatives on Cold Comfort Farm. Flora makes it her mission to improve the lives of the miserable inhabitants. 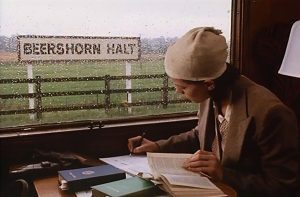 The TV movie parodies the romanticised, sometimes doom-laden accounts of rural life and is directed John Schlesinger (Marathon Man, The Next Best Thing) and written by Malcolm Bradbury (The Gravy Train, In the Red). Kate Beckinsale (The Aviator, Underworld) takes the leading role of Flora alongside Eileen Atkins (Cold Mountain, Robin Hood), Sheila Burrell (Jane Eyre, Perfect Strangers), Stephen Fry (Alice in Wonderland, Sherlock Holmes: A Game of Shadows), Freddie Jones (The Elephant Man, Dune), Joanna Lumley (Corpse Bride, Absolutely Fabulous) and Ian McKellen (The Hobbit Series, Vicious). 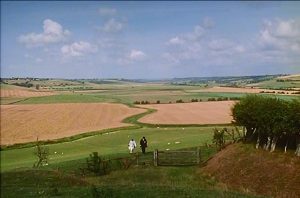 The production filmed on location in Kent at Kent & East Sussex Railway which provided the trains for Flora’s journey from London to her relatives at Cold Comfort Farm and Northiam station which is the fictional railway station of Beershorne. The Royal Military Canal was also used for scenes where Flora and Amos (Ian McKellen) walk and chat. Kent & East Sussex Railway is a ten and a half mile rural light period railway which runs between Tenterden and East Sussex. 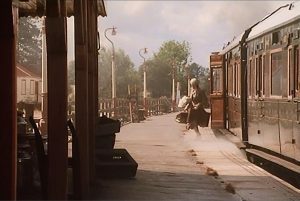 The railway has also been used for filming by productions such as Richard E. Grant on Ealing Comedies (2016), Last Passenger (2013) and Jude (1996). The Royal Military Canal runs for 28 miles between Seabrook near Folkestone and end at Cliff End near Hastings. The canal passes the iconic Romney Marsh, tranquil countryside and quiet villages and has a footpath for the entire stretch. 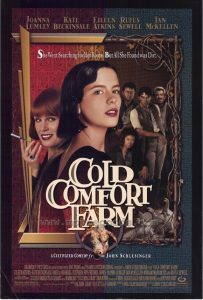 Cold Comfort Farm was broadcast on 1 January 1995 and is now available for DVD purchase. This entry was posted in Filmed in Kent and tagged Cold Comfort Farm film locations, feature film, Kent and East Sussex Railway, Royal Military Canal. Bookmark the permalink.